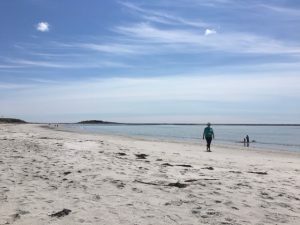 By the time Judy and I reached Goose Rocks Beach, we had been on the Maine coast for several days and were already chilled out. The night before we had lounged in our room at the Breakwater Inn overlooking the mouth of the Kennebunk River, watching lobster boats come and go for hours while googling the lobster trade and all it entails. So the beach simply took us to the next level of relaxation. Mid-week in late May, we pretty much had that long strip of sand all to ourselves. A dozen other people were there when we arrived but most of them cleared out before noon. This is why we like to visit the Maine coast off-season. I can only imagine how crowded the beach must be in the middle of summer. Judy first came here in 1985 – the year she and I met. Her mother had just died so she came to the coast to be alone and process her grief, to seek solace in salty air, the call of gulls, and water washing endlessly to shore. The ocean is to her what the forest is to me. So she walked the beach by herself again while I stayed with our folding chairs and other beach accouterments. In her absence, I stared out to sea. When she returned we sat together on the beach, enjoying a gentle breeze on a mostly sunny day. In contrast to the shady forest where I usually roam, the sun beat down relentlessly, and our gazes towards the thin blue horizon went farther than our thoughts. In other words, we became beachified, utterly incapable of intense intellectual activity. And sometimes, yes, sometimes that’s a good thing.